This is Zein Youssef a Here to Serve child/family we support with the help of your donations. Childhood cancer boldly and without warning enters the lives of our sons and daughters without reason or cause. 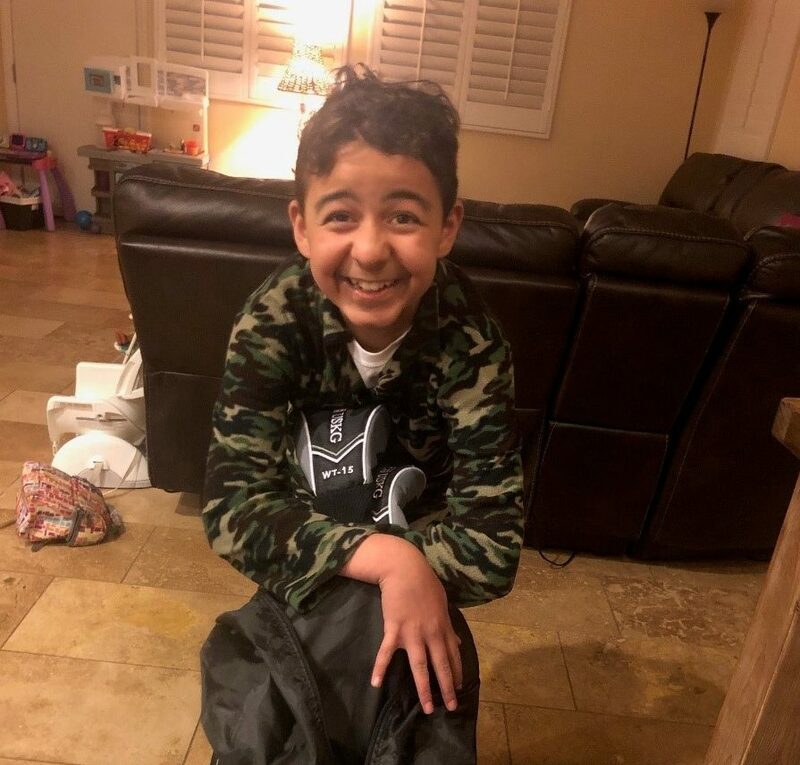 Zein has bravely been battling cancer since he was 6 years old and has experienced 4 relapses; his last being a secondary cancer resulting from previous chemo treatments. He has endured over 55 sessions of chemotherapy, 600 chemo pills, 50 sessions of radiation, 3 clinical trials and 45 trips to the operating room! During treatments he often loses the ability to sleep, attend school, think, play or function and experiences extreme pain. He deals with paralysis in parts of his body and still maintains his infectious smile while adjusting his life to what he can do. A few years ago, Zein trained in Tai Kwon Do, obtaining his first-degree black belt. He no longer is able to do Tai Kwon Do due to increased paralysis from treatments and surgery. Focusing on what he can do, his Dad suggested golf as a family activity they all can do, including Zein. But Zein had no golf clubs and finances were such that this was not an expense that could not be absorbed on top the family’s living and medical expenses. In early March, because of the generosity of our donors, and Here to Serve being a 501 (c) (3) nonprofit, we negotiated with U.S. Kids Golf who generously reduced the cost so golf clubs could be purchased not only for Zein but for his sister Malak! Often, we forget that siblings are also impacted and give up a lot too! You may wonder what the value of supporting Here to Serve is? Our Here to Serve care community members see that they are providing meals and other daily needs for our families. However, organizing those efforts and keeping people involved and engaged over the long journey takes time, effort and skill; in some cases, as long as 6 or more years. There are many unseen ways in which Here to Serve steps up to help families. Because of your support and donations to Here to Serve as an organization, (beyond the funds we help raise for the families we serve), we have organized product and service donations to our families from other businesses and the community including: cars, rehabilitative devices and bikes, burial and cremation expenses, counseling, as well as provide resources in the way of CPA’s, home repair, short-term housing, packing and moving, special birthday party venues and surprises, gifts for the holidays, Thanksgiving meals, patient advocates, attorneys, travel agents, respite trips, tickets to venues and amusement parks, and so much more. Your donations to Here to Serve COUNT for A LOT! Please be as generous as you can so we can continue blessing the families we serve.